Draft: 2014, Kansas City Royals, 8th rd. Full name is Ryan Patrick O'Hearn…resides in Frisco, Texas...Graduated from Wakeland High School (Texas) in 2011…batted .505 with 15 homers and 55 RBI as a senior, earning Second Team All-America honors from Baseball America...Attended Sam Houston State University (Texas), where he was teammates with current Royals' farmhand Corey Toups…batted .292 with eight homers and 44 RBI during his final collegiate season (2014). Started the season with Omaha (AAA), where he hit .232/.322/.391 (82-for-353) with 33 extra-base hits and 52 RBI in 100 games... Selected from Omaha on July 31 and made his Major League debut that night in Chicago, where he hit a tworun HR in the fifth inning off James Shields, becoming the third Royal to HR in his first Major League game, joining Clint Hurdle (Sept. 18, 1977) and Mark Quinn (Sept. 14, 1999 (Game 2))...His 12 HR and 24 extra-base hits are most by a Royal through 44 career games, and his 30 RBI trail only Mark Quinn (32) and Bob Hamelin (31)...Since 1908, only five American League players have more than 12 HR and 30 RBI through 44 career games, including: Gary Sánchez (2015-16), José Abreu (2014), Wally Joyner (1986), Sam Horn (1987) and Zeke Bonura (1934)...From July 31 (his Major League debut) through season's end, his .597 slugging percentage ranked sixth in the American League (min. 150 PA)... Hit .105 (2-for-19) through his first six games, but hit .285/.367/.646 (37-for-130) with 23 XBH (11 HR) and 27 RBI in 38 games after that... From July 31 (his Major League debut) through season's end, his .705 slugging percentage and 1.108 OPS vs. right-handed pitchers ranked third in the Majors, trailing Christian Yelich (.768/1.223) and Shohei Ohtani (.718/1.125)...Hit the first of back-to-back HR with Hunter Dozier to walk-off Cleveland on Aug. 24, becoming the first rookie teammates in Major League history, according to Elias, to hit back-to-back game-tying and gameending HR in the ninth inning or later...Had a career-high-tying three hits and a career-high four RBI in a 9-2 win on Aug. 31 vs. Baltimore, becoming the seventh Royal with a three-hit, four-RBI effort within his first 21 career games and first since Irving Falu on July 1, 2012 (Game 15)...Hit .314/.400/.743 (11-for-35) with eight extra-base hits (3 HR) and nine RBI in 10 games vs. Cleveland, including his first career multi-HR game on Sept. 3 at Progressive Field...Hit .276/.382/.579 (21-for-76) with 12 extra-base hits (5 HR) and 16 RBI in 22 home games…only two other left-handed batting Royals have had a higher singleseason slugging percentage at Kauffman Stadium (min. 80 PA): Bob Hamelin (.646 in 1994) and George Brett (.628 in 1985, .685 in 1980 and .633 in 1979)...During a five-week stretch from Aug. 13-Sept. 17, his average exit velocity of 93.0 mph ranked sixth in the American League (min. 50 batted balls), according to Statcast...Hit just .108 (4-for-37) vs. left-handed pitchers, but two of those hits were HR, including a solo shot vs. AL Cy Young Award winner Blake Snell (who allowed just 2 HR vs. left-handed batters in 137 PA), and a solo shot vs. Steven Brault (the 1st HR he'd allowed vs. a lefthanded batter in 185 career PA)…hit .271/.370/.471 (23-for-85) vs. left-handed pitchers with Omaha...Hit just .181 (17-for-94) in his first plate appearance vs. a pitcher in a game, but hit .400 (22-for-55) after seeing him a second or third time. Spent a majority of the season at Omaha (AAA), but played his final 19 contests at Northwest Arkansas (AA)…played in 133 games combined, one shy of matching his career high from 2016... His 22 home runs combined between his two stops were third-most among Royals' farmhands, trailing only Jorge Soler (24) and Frank Schwindel (23)... Opened the year hitting .316/.372/.570 (25-for-79) with five doubles, five homers and 12 RBI in his first 20 games…also hit .297/.387/.574 (30-for-101) in the month of July... Recorded the fifth multi-homer game of his pro career on July 1, hitting a two-run shot and a three-run shot vs. Colorado Springs…matched a season-high with five RBI... Optioned to Northwest Arkansas on Aug. 14, where he homered four times in his final 19 games... Entered the year as the No. 8 prospect in the Royals' organization according to Baseball America…ranked as the No. 14 prospect by MLB.com following the season. November 26, 2018 Gigantes del Cibao placed 1B Ryan O'Hearn on the reserve list. October 22, 2018 1B Ryan O'Hearn assigned to Gigantes del Cibao. July 31, 2018 Kansas City Royals selected the contract of 1B Ryan O'Hearn from Omaha Storm Chasers. March 26, 2018 1B Ryan O'Hearn assigned to Omaha Storm Chasers from Northwest Arkansas Naturals. 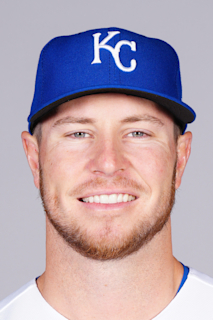 January 5, 2018 Kansas City Royals invited non-roster 1B Ryan O'Hearn to spring training. August 14, 2017 1B Ryan O'Hearn assigned to Northwest Arkansas Naturals from Omaha Storm Chasers. April 3, 2017 1B Ryan O'Hearn assigned to Omaha Storm Chasers from Northwest Arkansas Naturals. January 7, 2017 Kansas City Royals invited non-roster 1B Ryan O'Hearn to spring training. May 4, 2016 1B Ryan O'Hearn assigned to Northwest Arkansas Naturals from Wilmington Blue Rocks. March 9, 2016 1B Ryan O'Hearn assigned to Kansas City Royals. July 17, 2015 1B Ryan O'Hearn assigned to Wilmington Blue Rocks from Lexington Legends. April 8, 2015 1B Ryan O'Hearn assigned to Lexington Legends from Idaho Falls Chukars. June 15, 2014 1B Ryan O'Hearn assigned to Idaho Falls Chukars. June 10, 2014 Kansas City Royals signed 1B Ryan O'Hearn.